Migration corridors depend on maintaining both habitat connectivity and animals' knowledge of the landscape, demonstrated by these migrating bighorn sheep in Park County, Wyo. University of Wyoming researchers Matt Kauffman (right) and Kevin Monteith release a cow moose during a GPS collar migration study near Daniel, Wyo. Research has found that animals learn to migrate over several generations and pass that knowledge to other members of their herd. "If a migration is lost, from some sort of disturbance to the landscape that cuts their migration off, it takes a long time for these migrations to re-establish because they require animals to learn about their landscape, pass that knowledge on to young, who then augment that knowledge with their own experiences and then pass that on to young, and so on and so forth," explains Brett Jesmer, an ecologist at the University of Wyoming. "It's this really slow development of knowledge over time that allows them to optimally use their landscape and begin migrating." Scientists had long suspected that large mammals must learn to migrate — after all, they've observed how babies follow their mothers around. But the idea hadn't been tested until now. 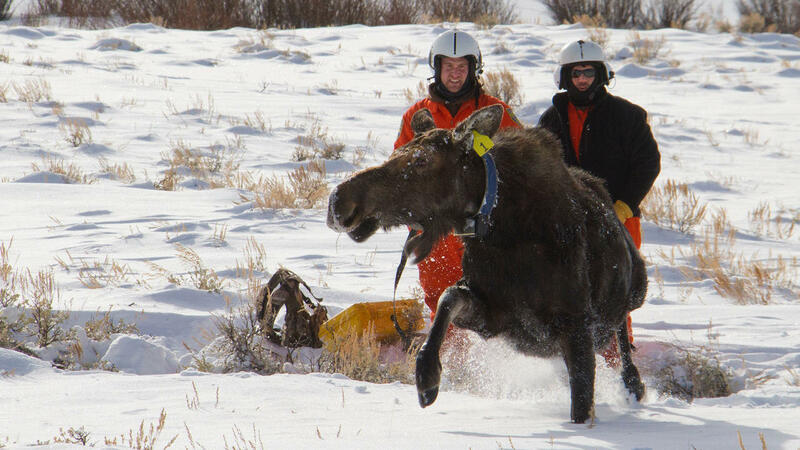 Jesmer and his colleagues gathered GPS tracking data on 267 bighorn sheep and 189 moose in the western U.S. Importantly, the researchers knew that some of these populations had been relocated to these areas over the past 60 years, after the original populations had died out in the mid-1800s or early 1900s because of hunting or disease. That allowed the team to compare the migration patterns of newcomers with groups of animals that had lived in their landscape for much longer, at least 200 years. "We know they were there at the time of the Lewis and Clark expedition, and probably for hundreds or even thousands of years prior," Jesmer says. The researchers combined information about the animals' tracked movements with satellite imagery that showed when and where plants were greening up across the landscape. Migrating herds move up mountainsides to reach the best food as it becomes available at higher elevations, then move back down as the weather gets colder. When sheep were first taken from migratory populations and relocated into vacant, unfamiliar landscapes, Jesmer says, "they failed to migrate, almost completely. They also didn't track the pattern of plant green-up across the landscape very well either." Less than 9 percent of recently relocated animals migrated, compared with 65 percent to 100 percent of historic herds, according to the report. "That was sort of a little bit of an 'Ah-ha!' moment for me. These animals really have to learn how all of this happens, where things green up and how it happens and where they need to move next," says Matthew Kauffman, a wildlife researcher at the U. S. Geological Survey who was on the study team. 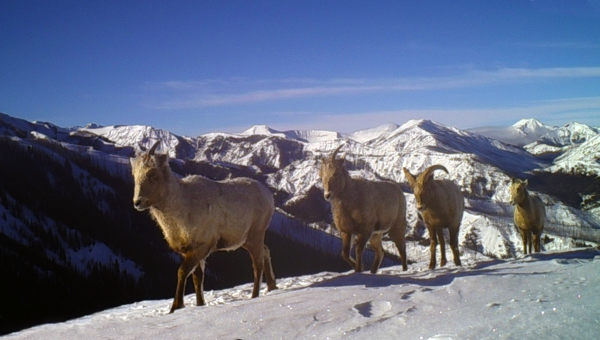 By studying herds that had been introduced to new areas at different points over the past century, the researchers figured out that it takes about 40 years for reintroduced bighorn sheep to develop a robust migration. Moose took about 90 years. Other wildlife experts say the results are compelling and impressive. "The dimension that they're bringing to migration ecology is memory and cultural transmission of information," says Jacqueline Frair, a wildlife ecologist at the State University of New York in Syracuse. "There's a lot of simulation models that have shown how migration can break down when we start losing our leaders and our knowledgeable individuals," Frair says. "But this paper really looked at it empirically from a number of different populations, with a lot of different individuals." The take-home message, researchers say, is that the most effective way to protect migrating animals is to conserve the migration corridors they use now. "It may take hundreds of years to build a robust culture of migration," Frair says. "Once we lose migratory populations, we may never recover them given an uncertain climate and land use." Plus, wildlife ecologists' ideas about the quality of a habitat has typically just involved studying physical features such as the abundance of grass, according to Kauffman. He thinks that in the future, animals' knowledge of how to exploit the physical landscape needs to be incorporated into that evaluation. "In the American West, we have these big landscapes, and many of our ungulate herds migrate across those landscapes," Kauffman says. "This study shows that the thing that enables them to move across these big landscapes is their knowledge, which has been accumulated over generations." Some birds and insects have an innate drive to migrate - not so for big-hoofed mammals like sheep or moose. NPR's Nell Greenfieldboyce reports on a surprising new study that shows these animals have to learn to migrate, and they are not exactly quick studies. NELL GREENFIELDBOYCE, BYLINE: Brett Jesmer is an ecologist at the University of Wyoming. He says there have long been hints that large mammals aren't born knowing how to migrate but learn from their parents. BRETT JESMER: So biologists might be in the field observing moose, and they see that the moose calf followed its mother on its spring and fall migration. GREENFIELDBOYCE: Moving from place to place to follow new, green grass. To see if knowledge about migration really was passed down from generation to generation, he and his colleagues studied moose and bighorn sheep in the western U.S. Some populations had lived on the same land for a long time. JESMER: We know they were there at the time of the Lewis and Clark expedition and probably for hundreds or even thousands of years prior. GREENFIELDBOYCE: Others had moved in over the last 60 years as conservationists brought animals to areas where the original populations had disappeared due to hunting or disease. What the researchers found using GPS tracking and satellite imagery is that animals put into vacant, unfamiliar land didn't migrate. Matt Kauffman is a wildlife researcher at the U.S. Geological Survey. MATT KAUFFMAN: That was sort of a - little bit of an aha moment for me of, like, wow, they really have to learn where things green up and where they need to move next. GREENFIELDBOYCE: In the journal Science, the researchers say it took bighorn sheep nearly 40 years to develop a robust migration. It took moose nearly 90 years. The study impressed Jacqui Frair. She's a wildlife ecologist at the State University of New York in Syracuse. JACQUI FRAIR: The dimension that they're bringing to migration ecology is memory and cultural transmission of information. GREENFIELDBOYCE: She says this shows we need to protect animals' existing migration routes now because there's no easy fix if a migration culture is lost. Nell Greenfieldboyce, NPR News. Transcript provided by NPR, Copyright NPR.